From March 15 to June 30, 2019, earn distributor credit for qualifying purchases that bundle Sure Power™ Selective Herbicide with your choice of performance-proven rotation partners, Escalade® 2 and Cool Power® herbicides. Unit size options include a 2 x 2.5-gal.option with a $30 incentive, a 30-gal. drum option with a $500 incentive, or multiple large-volume options with a potential $2,100 incentive. After one qualifying invoice, program participants will continue to save on individual purchases for the duration of the program period. 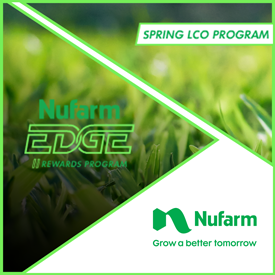 Learn more and register at nufarmrewards.com.